I was experimenting again yesterday. This time after reading "Daring Adventures in Paint" by Mati Rose McDonough. 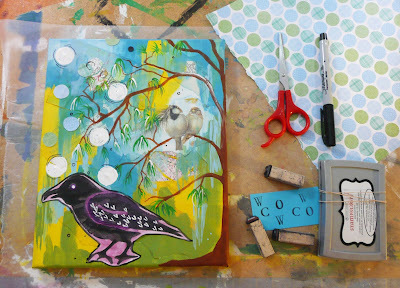 End result, this painted collage and I will be trying this out with Grade5/6 next year I think. 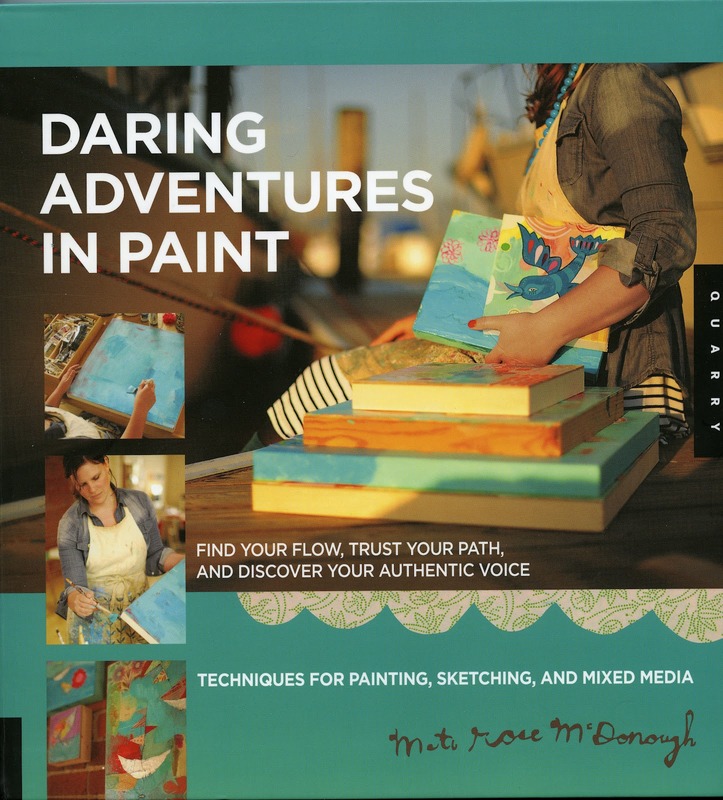 "Daring Adventures in Paint" by Mati Rose McDonough is a new book from Quarry. Lots of great photography which in any art instruction book is always appreciated. using silver leaf, spray painting with doilies. 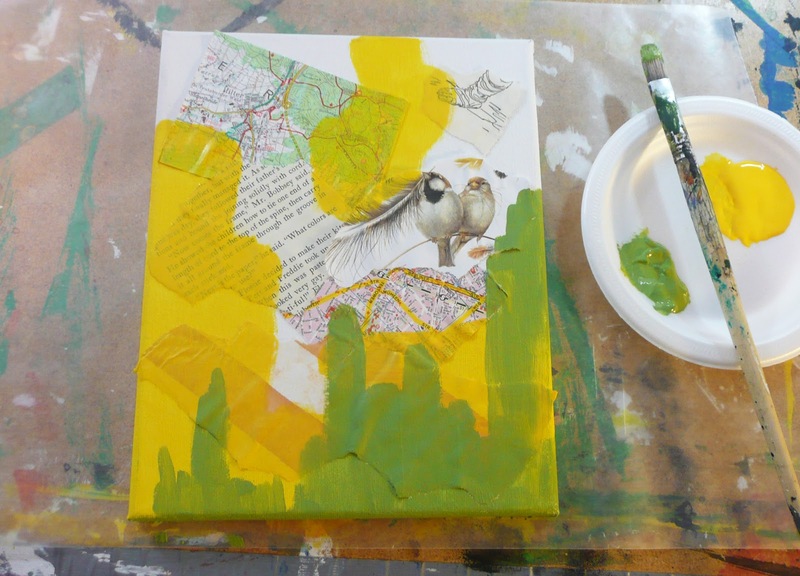 transferring sketches onto specific areas of a painting and developing your narrative. Where this book shines is in it's practical take on the developing artist....how do you take that "Wouldn't it be great to paint my own canvas for my bedroom" to identifying how to locate inspiration, finding your voice and confidence as an artist, and then transferring that into completed work. I will be giving away a copy of this book later this week, see the end of this post for details but first let's go thru the painted college using some techniques from Mati. - assorted papers from recycling, junk mail, etc. - sealer, optional. 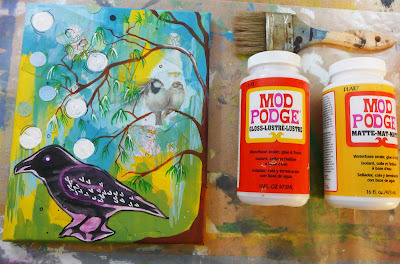 I like Mod Podge! 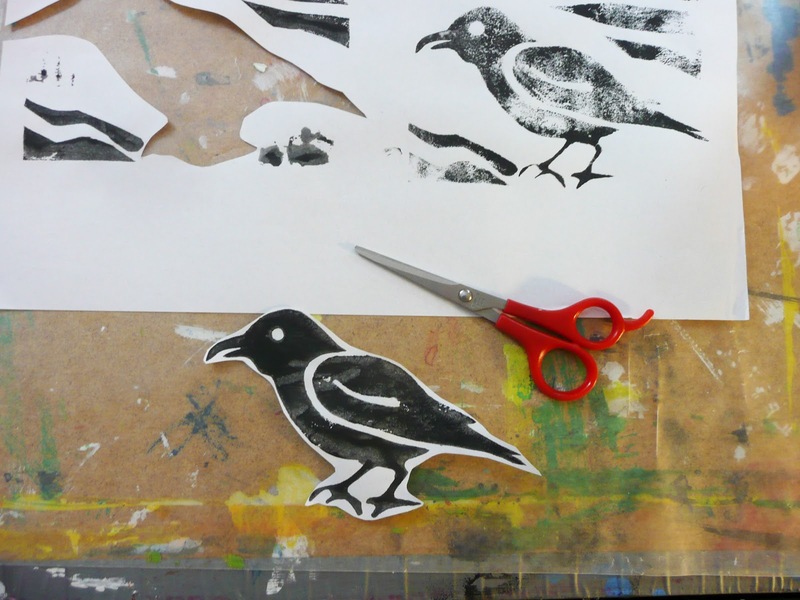 Before I started this collage I decided to make some homemade stamps. Now this is not discussed in the book but it's so easy. 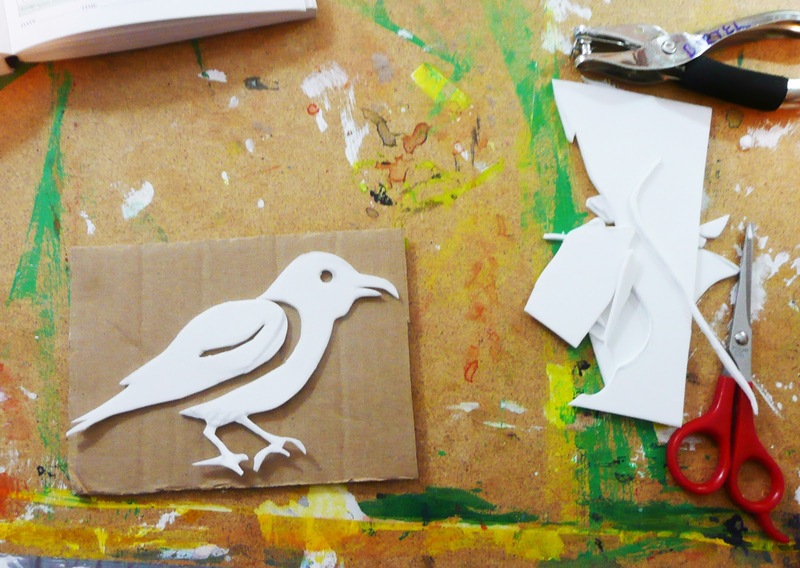 Take some craft foam and a piece of corrugated cardboard (or foamboard, or gatorboard). You want it the size of your stamp. Cut out your design. This is different than the other stamps I make by etching designs in foam with a pencil. 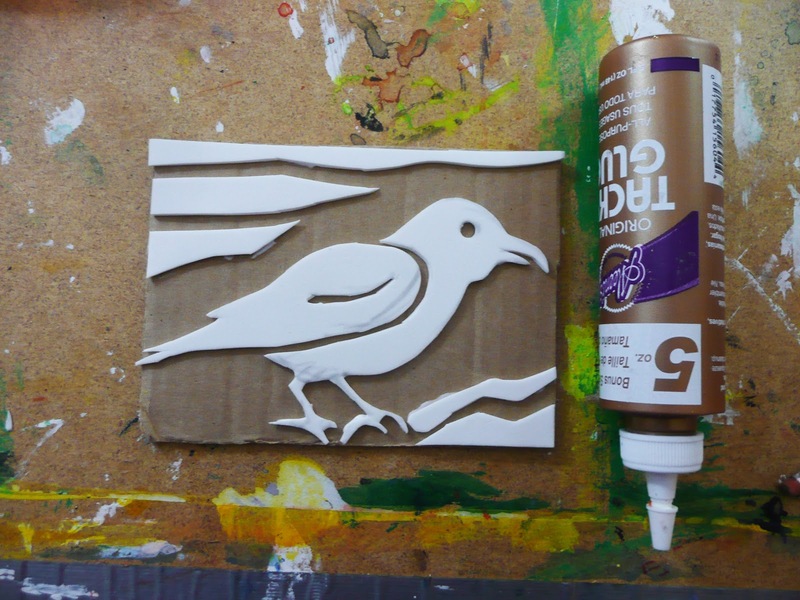 Glue into place on the cardboard. You can skip this step if you use the craft foam with the sticky backing. 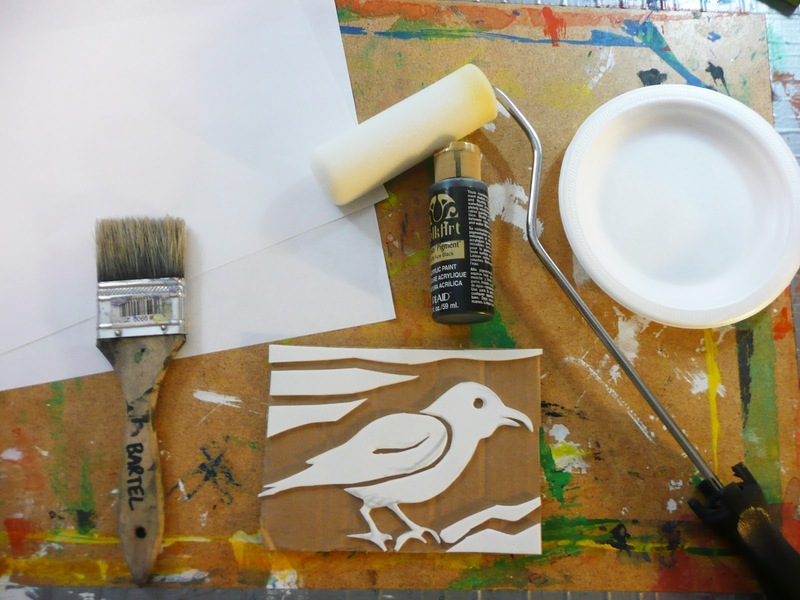 Gather some supplies for printmaking. - disposable plate or even newspaper, waxpaper to squeeze your paint onto to load your brush or roller. If I use a plate I will wash it and reuse it again and again. 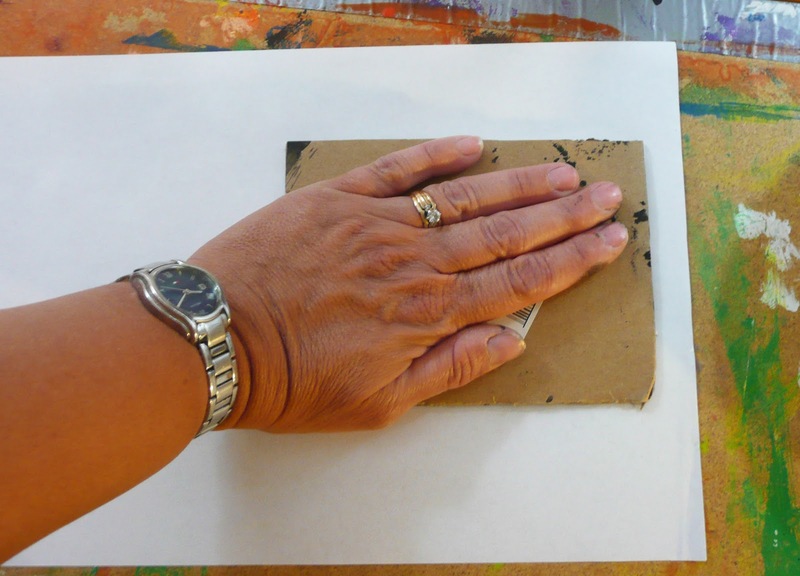 Apply paint to your stamp and turn it facedown onto your paper. Rub all over the stamp with your hand applying a bit of pressure. You can also use a brayer here. Lift to see your impression. The one on the left was using a paintbrush, the one on the right was a roller. Keep your stamp as you can use it over and over again. Take your base, (canvas, board, paper) and glue down some of your collected papers. Some of my edges are cut some torn. I know what colors I want to use in the final piece so I'm choosing very neutral colored papers. Start adding paint to your background. No rules here. Paint over some of the paper while leaving some areas untouched. Remember to do the sides if using a board or canvas. I want to add my stamped paper. So I cut out the part I want. I then tint it with paint and glue into position. 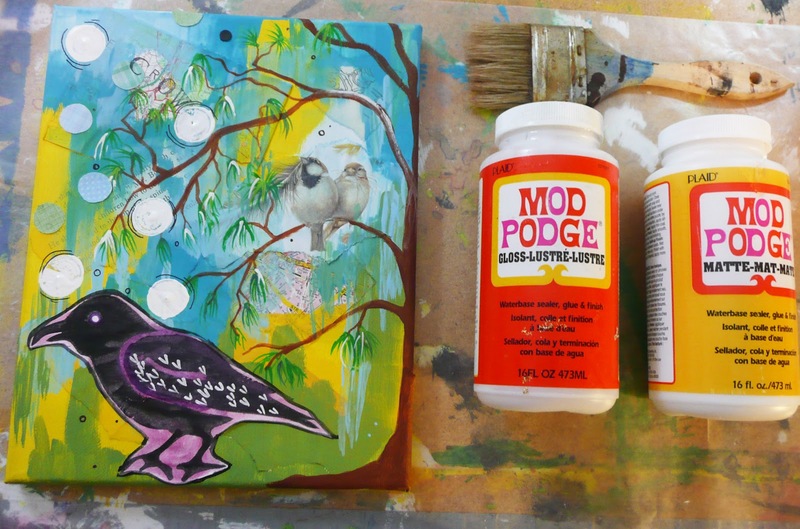 Add details with more acrylic. Here I'm stamping circles using an old spool dipped in paint. Add more paper details if you want. I cut the circles out of this scrapbooking paper as they were in my color scheme. I added some sharpie and stamped on the word CROW using the R that was already there in the map paper. Fiddle with it until you are satisfied. 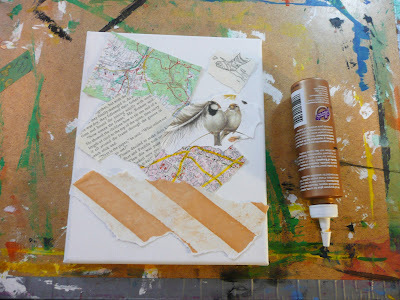 Finally when everything is dry add a sealer over top to glue everything down. I used Mod Podge matte finish this time. It still has a bit of a sheen to it. That's it. I love the way I really did not have a plan but the work just came together......this will be a great lesson for the kids! I will be making the random draw on Friday Aug 3rd/12. In the spirit of the Olympics I am opening this draw up to everyone. Good luck. Thanks to my friends at Quayside Publications for sponsoring this giveaway. I love how your painting turned out. I can't wait to give this a try. Thanks for sharing and the opportunity to win Mati's book! Beautiful collage!! I would absolutely LOVE to win this book!!! What a beautiful picture! I'm in! cool! I've never heard of this book, but would have lots of fun getting inspired from it. I am always inspired by your projects. 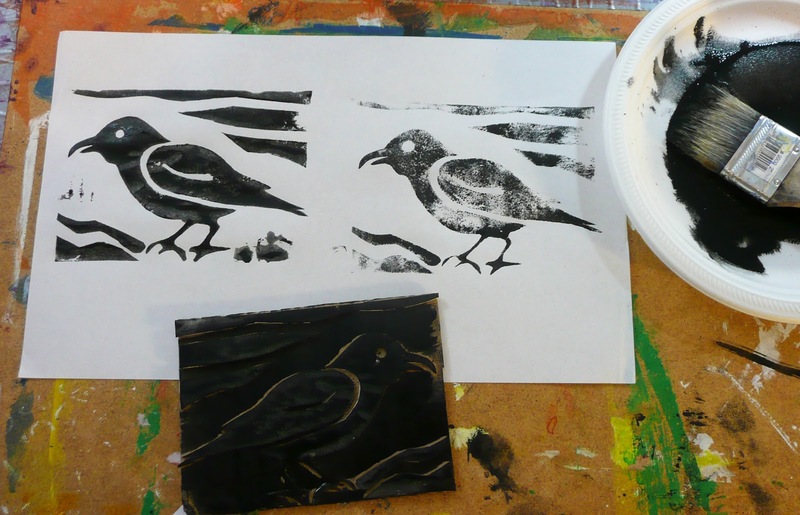 Love the printmaking aspect especially. This looks like a great resource! Wonderful giveaway! I would love to add this to my collection of art books for more inspiration! Your work is so creative , colorful and so much FUN! :) I think your book is going to be fabulous, and hope that you pick me! 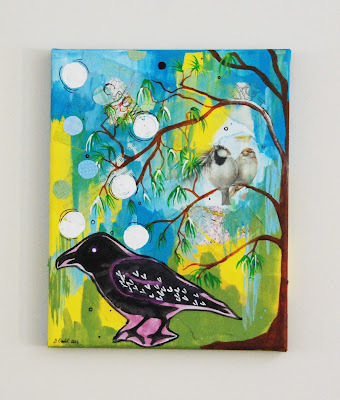 :) I'm sharing this link on my Facebook page and Pinterest for all my creative friends to check out too! This book sounds so helpful and looks like fun! 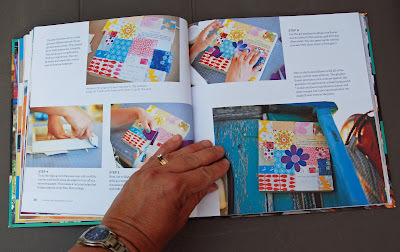 I would love to have it, I often find it hard to channel my inspiration, great collage! I can't wait to check this book out. I would love to win! I would love to win this for my artistic daughter who really needs more direction than I can give her. Thanks! I would love this book! I enjoy your blog. Love this stamp - I have been exploring printing this term, done gelatin mono printing about to do reduction printing. 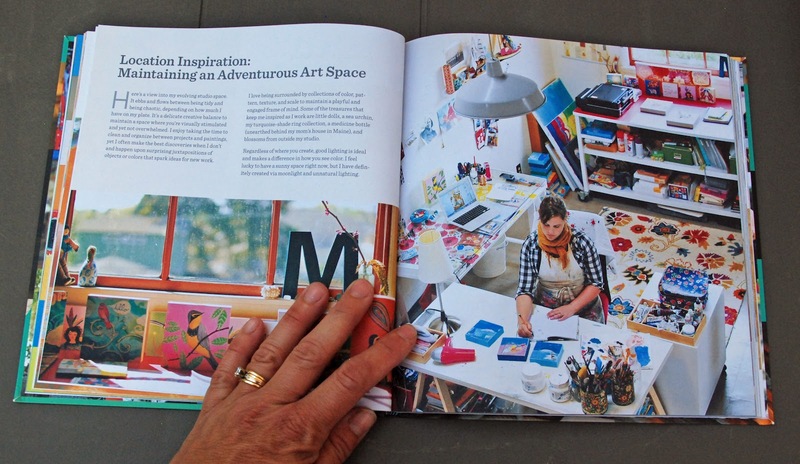 This book would be great for more inspiration for painting. Your spool tool is clever! I had fun paint stamping with celery and bok choy this spring with my kids. My girls and I have tried our hand at making paper bag books of our own (I am far behind them in execution). Daring Adventures in Paint sounds like fun for all. I so need a hobby!! Pick me. I love all of your ideas! I would also love to have the book! Thanks for keeping the inspiration coming! I really enjoy your blog! I have been teaching art to young children for decades. It is always great to find a new book for inspiration and Daring Adventures in Paint is a book I would like to own. You make it look so easy. The stamp is great. I am not very good at the 'random' kind of creating- much more structured works for me but I'd love to find a bit more 'wild abandon' in me. Love the title of this book, which reminds me of a Helen Keler quote: Life is either a daring adventure or nothing." I love your blog and am always telling my sister about the things you do. Then she actually does some of them. I'd really like to try some of the ideas in the book. Thanks for the great tutorial, I'd love to win this book for some new ideas to try. I'd love to crack open this book, it looks great! Thanks for the opportunity. I really appreciate your blog and the great things I can do with my kids. 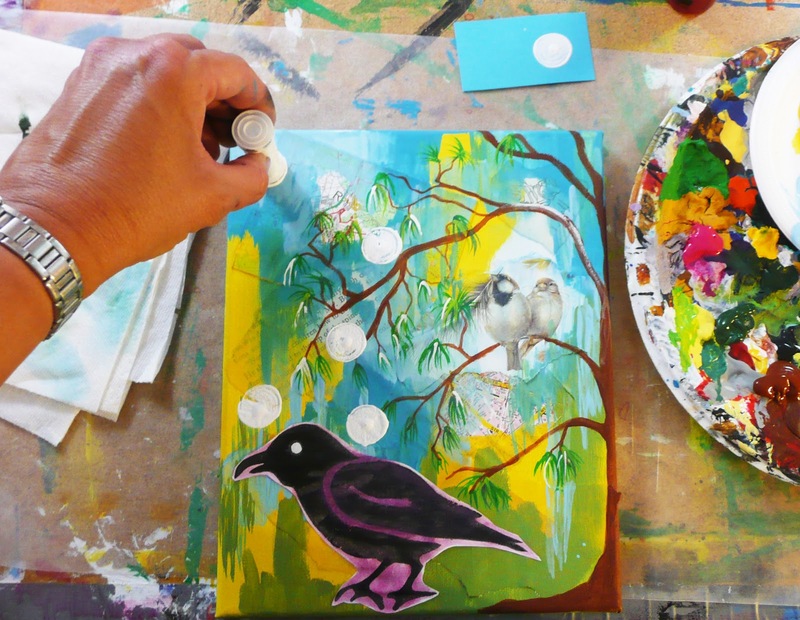 Maybe sometime you could share some practical ideas for creating an art space in the home and even how to organize/save things for projects...supplies, etc. Thx a bunch. I check your blog for ideas for my son and this book would be of great help. This book looks awesome. I do a lot of Painting projects with my granddaughter and you have taught me so many new techniques. Thanks for sharing!! This looks like a wonderful book. I love it when art books have great photographs. Your artwork turned out very nice. ooohhhhhh, how cool is this! would love to attempt this incredible project with my kiddos. your enthusiasm for all things art is infectious! thank you for sharing your talents with us as always. What fun! 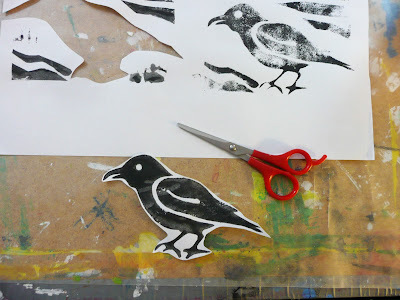 I've done collographs before, but this could be a step up for older kids! Thanks for sharing so clearly! The book looks very inspiring! I love seeing all the different projects. 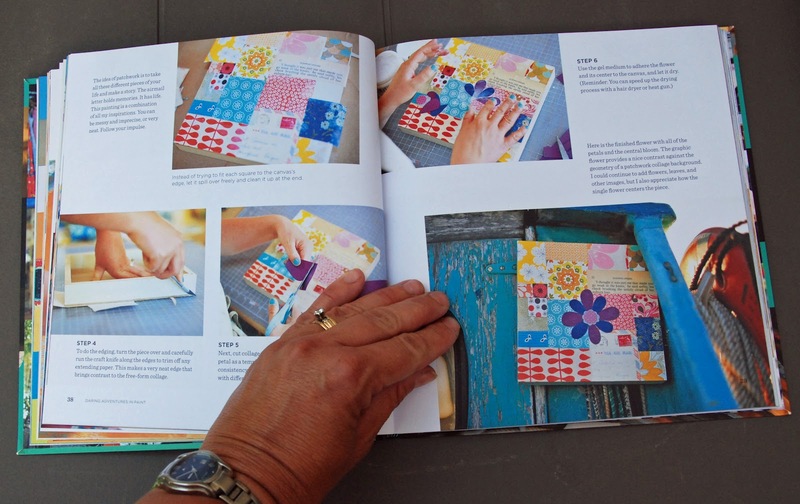 I teach k-12 art and can see using this book. Wonderful! Love to win a copy to jump-start our school year. You've inspire me to give it a go! I love collage & this is a great one! I love your make-your-own-stamp technique. I will definitely be trying that one! Thank you! I love the sounds of this book. I've been wanting to learn more about this type of media,and would love to have this book. Also, I just want to thank you for such a wonderful website. I love all your projects, and the simplicity of them. 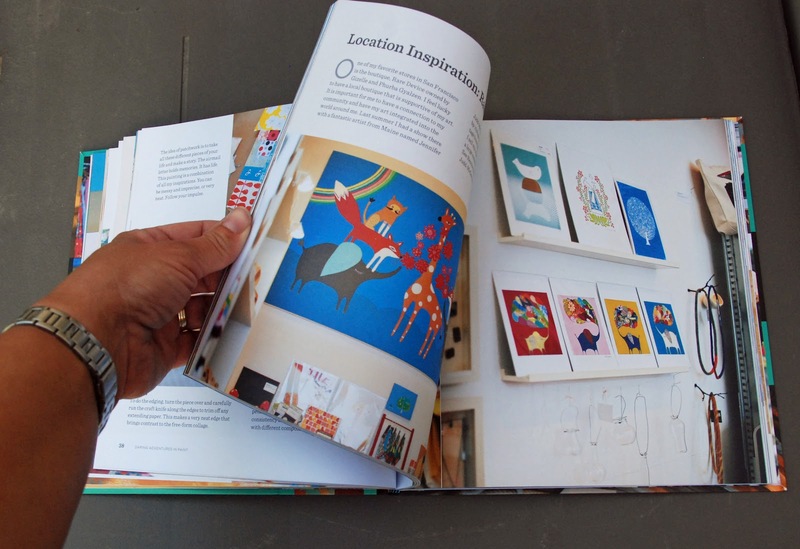 Oh...love this book and your painting! Would also love to own this one. Thanks for the chance to win it on here! We would love to win this book for our homeschool! thank you! Thanks for opening this giveaway to all.I'd love to have this book - hope to win. Thanks Gail! Great book review - I hope to win but if I don't that's ok too cause I think I'll buy it. Great ideas for my son & I. Such a great technique and I'm excited about the book. I also enjoy following your blog very much. You can't win if you don't try. Thanks for all the inspiration. I enjoy reading your ideas very much. I'd love a copy! And I'm definitely going to try this project. Thanks, as always, for your great site! Thanks for the continual inspiration! We'll be trying this out in my art classes soon! In case I should be lucky enough to win, here's my email address: damajade (at) yahoo dot com. Thanks Gail! Love your blog. Great review and project. Keeping my fingers crossed! Love the idea Gail. Will definitely give it a try!